General Motors this summer announced a major overhaul to the format of its repair procedures, one aimed at replacing technician judgment calls with more precise instructions. GM body structure service engineering advanced serviceability of design team leader Bob Hartman recalled during a NACE training event July 27 that the company’s old line-art collision repair procedures had about 15-20 operations, mostly related to sectioning. The company didn’t spell out the rest of the repair procedures, leaving those calls up to what it assumed was a standard technician with standard training. 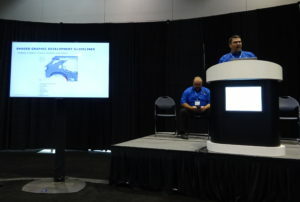 Learn how to access and use OEM repair instructions during the SEMA Show from John Shoemaker, BASF, with “The Basics of Blueprinting”; Matthew McDonnell, Big Sky Collision Centers, with “Building a bulletproof estimate through proper documentation”; Dave Gruskos, Reliable Automotive Equipment, with “Get Attached to Following Procedures: A Comprehensive Guide to OEM Joining”; and Larry Montanez, P&L Consultants, with “How to Find, Read and Understand OEM Repair Procedures.” The sessions are part of the Society of Collision Repair Specialists’ Repairer Driven Education Series Oct. 30-Nov. 3. Register here for the individual classes or the series pass package deal. Each weld and adhesive location will be identified, and GM will also provide instructions for removing difficult adhesives, according to Hartman. Prior part replacement procedures had been left up to the technician, but GM now will say how to do them. The idea is to improve technician quality and productivity, according to Hartman. 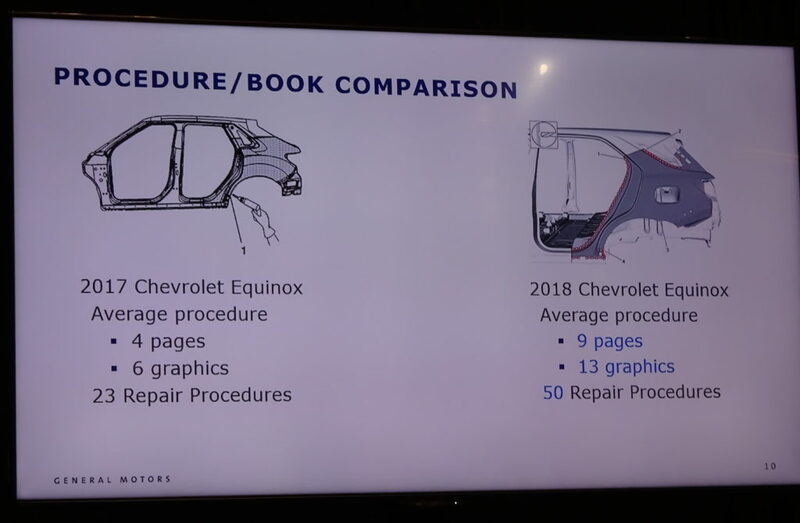 Hartman demonstrated the overhaul by comparing the repair procedures for a 2017 Chevrolet Equinox and the next-generation 2018 model. The 2017 Equinox has instructions for 23 operations, according to Hartman. It has graphics, but they might not be as specific as one would like. The 2018 Equinox has steps for 50 repair operations and a ton of detailed, color graphics according to Hartman. He said at the July event that his team was still writing what was likely to be more than 70 procedures for the more complex 2018 Chevrolet Traverse. The 2018 Equinox instructions haven’t yet dropped on GM’s free collision repair procedures website, but shops can get a sense of the new format by consulting the directions for the 2017 Chevrolet Cruze, which had shed weight and boosted higher-strength steel content with the release of the second-generation model the prior year. 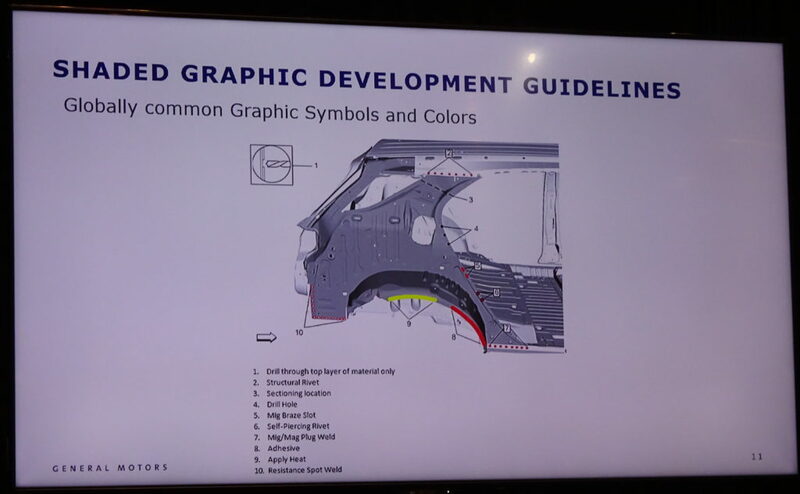 The new GM format makes extensive use of symbols to designate the location of items like structural and self-piercing rivets, specific types of welds and structural adhesives. GM also shows where heat can be applied safely to debond an adhesive without compromising the integrity of higher-strength steels contained in the vehicle. There’s even an icon informing a technician to only drill through just a single layer of a spot weld. Hartman called it “very important to not drill through that second layer”; otherwise, a technician won’t have enough metal for resistance spot welding. “There is no repair,” Hartman said. If an estimate says to repair an ultra-high-strength steel part, “hopefully a flag will come off” in a technician’s mind and cause them to object. The new manuals also include the location of foam as well as repair procedures for items like that foam, baffles and sealing strips. They’ll also discuss anticorrosion treatment and even specify certain corrosion protection substances GM would like you to use. P&L Consultants co-owner Larry Montanez mentioned the revised procedure format while directing shops to look up OEM instructions during an August “Repair University Live” on liability. GM’s procedures used to be ambiguous, he said. Now, the OEM declares, “‘You have to do it this way,'” he said. It’s important to note that while we’re linking to the free procedures on Genuine GM Parts, Hartman said those are no longer adequate for a shop seeking to properly repair GM’s vehicles. A shop must have both the collision and mechanical repair procedures to do the job right, he said. Using the paid site gives a shop both and activates all the links which are merely blue text on the free collision repair site’s PDFs — making for a more convenient and likely more thorough repair.